Too often in our teaching and our research we (myself included) neglect the fundamental role the Bible played in medieval Latin culture. We tend to talk around it and only thereby hint at the ways–read, interpreted, even unconscious–in which the object saturated Europe and the Mediterranean during the Middle Ages. Perhaps this isn’t entirely our fault. Perhaps the Bible was so fundamental a part of the background, so solid the foundation, that we have tended to miss what’s right before our eyes. But in so doing we pass that myopia on to our students, reinforcing this too-common misconception. Ah, but there’s a salve for this wound! 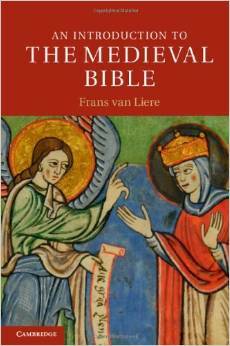 Frans van Liere has written an engaging overview of the Bible, in all its medieval forms, that should quickly become a foundation upon which the undergraduate English-language study of the medieval West will build. A brief introduction lays out the scope and aims of the book. Perhaps the most useful part of this introduction is a nice two-page overview on common “misconceptions” about the study of religion in the modern Academy–“useful” because the entire theme of the first several chapters can reasonably be summarized as “the medieval Bible is not what we today think the Bible to be” (2-3). Chapter 2, “The Bible as Book,” deals with this analytical point by considering its material culture, from its earliest instances as a scroll to the more commonly-known codex. Here, van Liere offers a useful reminder that not all (not even most) Bibles in the Middle Ages were pandects. These partial Bibles were often divided by theme, used in the liturgy, and so common in part because of the prevalence of separate psalters. Chapter 3, “The Medieval Canon,” and chapter 4, “The Text of the Medieval Bible,” continue this line but from the perspective of content. Even if two codices had the same texts, they were not really the same. Books of the Bible could have different names in different codices and be placed in different orders. Lamentations could be included as part of Jeremiah. Maccabees might or might not be there, and even if it were there, it might be in one, two, three, or four books. Then, even beyond that, even if you were reading the same book in different codices, there was really no guarantee in the early Middle Ages that they said the same thing. Only by the ninth century did Jerome’s become the most widely-used Latin translation, and even then the text was subject to consistent editorial “corrections” through the eleventh century. Only in the thirteenth century, thanks to the dissemination of “pocket” Bibles out of the University of Paris, did the text unwittingly move towards standardization. Now, having thoroughly destabilized the text itself, van Liere introduces the reader to how medieval people made that unstable text move. Chapter 5, “Medieval Hermeneutics,” and chapter 6, “The Commentary Tradition,” explain how Scripture was interpreted and then disseminated. We start from the premise that “the idea that the Bible was absolutely true, and needed to be read according to its own hermeneutical rules, was not really challenged until…Spinoza” (113). That does not mean interpretations were stable, though, despite protestations from medieval exegetes that they were absolutely not novel in their readings. These readings are always culturally located. Allegorical readings defined early Christianity and were used as a means to define itself against Jews and against heretics, while the Victorines’ literalism of the twelfth century created a new type of attentiveness to the periodization of sacred history. And these interpretations were created, read, copied, and transformed again and again. They spread in the early Middle Ages through stand-alone commentaries and florilegia and in the later Middle Ages through the Glossa Ordinaria. But they also spread in works we do not often think of as exegesis. Medieval historiography, for example, was dependent upon inserting contemporary or near-contemporary events into the arc of sacred history, becoming itself “a form of biblical exegesis” (156). The final three chapters take us outside of the cloister and to moments of interaction between literate religious and the majority of the population. Chapter 7, “The Vernacular Bible,” buries the confessional hobby-horse about the reading of the Bible in the Middle Ages by showing how the text in all of its translations circulated and was read outside a narrow clerical elite, even as it remained constricted in its reading audience, that latter fact in part due to the decreased authority vernacular translations had in comparison with the Vulgate. Chapter 8, “The Bible in Worship and Preaching,” pairs well with chapter 9, “The Bible of the Poor?” These concluding chapters talk about how most people in the Middle Ages would have experienced the Bible–aurally and visually. Sermons were a form of exegesis in and of themselves and would have been the primary entryway for the laity to the world of Sacred Scripture. Art reinforced the messages of the sermons, which reinforced particular interpretations of passages, which solidified the unstable text. In other words, van Liere’s book as a whole begins by destabilizing what we too often think most stable and concludes by demonstrating that art–in manuscript, in glass, in stone–was just the opposite: oftentimes seemingly ephemeral but truly a concretization of a long exegetical process that took into account the actual text, material culture of the codex, the translation in use, the interpretative strategies deployed in particular historical circumstances, and the cultural rhetoric used to disseminate the all of the above. Overall, An Introduction to the Medieval Bible is a well-produced, affordable, thoughtful, and engaging work. It has useful appendices, including a fascinating “Comparative Canon Chart” (265-268) showing how the structure of the medieval Bible varied across different time periods, a thorough index, and most helpfully a brief but accessible list of resources for further study at the end of each chapter. It is clearly a book designed for teaching but, as I hope I have shown, is one done by a scholar who appears to see well how teaching and research complement one another. Van Liere’s sensitive discussion of Haimo of Auxerre’s commentary on Jonah (113-116), for instance, is richly textured; van Liere introduces us to the weight of tradition each exegete felt, from previous commentaries as well as a sense of fidelity to the “true” meaning of Sacred Scripture, but also shows the intellectual vigor inherent in that kind of work and how it created something new, even despite itself. And van Liere does all this with economy–an accessible four-page snippet that could find a home in any university course. In other words, this is the work of a scholar who knows his stuff and can convey it clearly to an audience outside of his specialty. That’s a treasure. Buy this book. Use it in your teaching. Use it in your research too. Do it now. This review was originally published in The Medieval Review, an electronic publication of Indiana University. You can view the original entry here. Interested in learning more? Frans van Liere will be teaching a Calvin Academy for Lifelong Learning (CALL) class on “Reading the Bible in the Middle Ages” this spring. View the full schedule of Spring 2015 CALL courses here. This entry was posted in Frans van Liere, Historical Horizons and tagged An Introduction to the Medieval Bible, book note, book review, Calvin College History Department, Frans van Liere, history, medieval, The Bible. Bookmark the permalink.